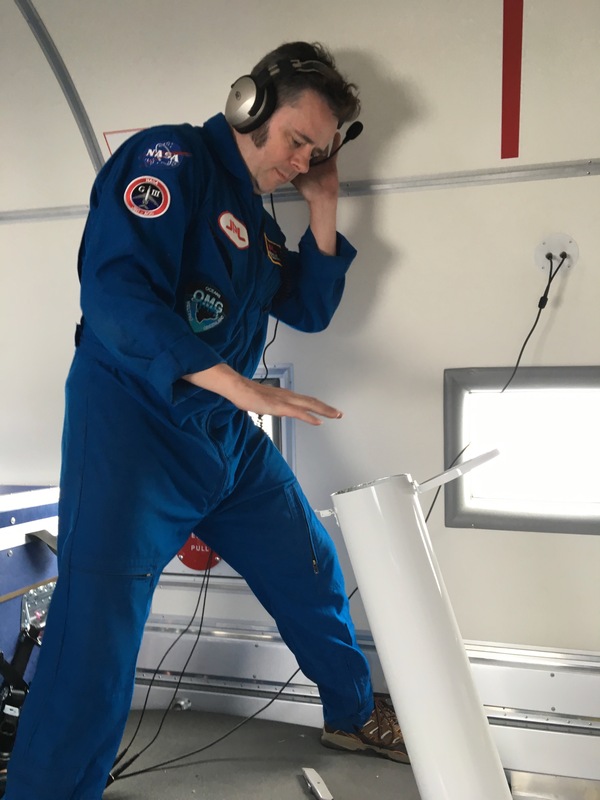 Ian is a co-investigator for NASA’s Oceans Melting Greenland (OMG) campaign, a five-year project to measure the effects of ocean water on Greenland’s rapidly melting glaciers. 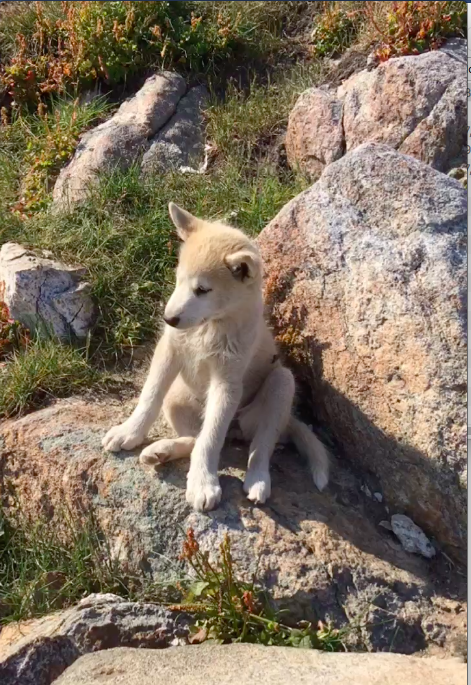 In August, he was the sole OMG representative on a research cruise to glacier fronts in northwest Greenland. And where there are glaciers, there are icebergs. 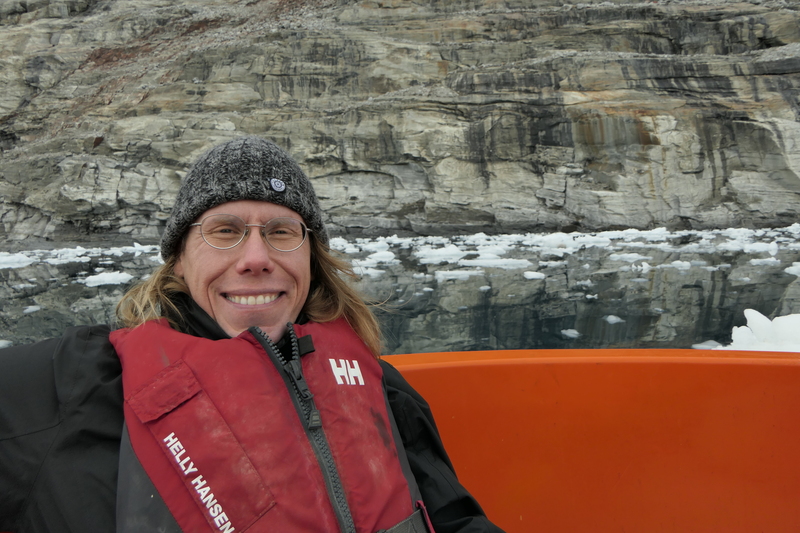 Through a professional connection with marine biologist Kristin Laidre of the University of Washington, Seattle, Ian had an opportunity to join the Greenland Institute of Natural Resources’ (GINR) week-long research cruise in northwestern Greenland. Malene Juul Simon of GINR’s Climate Division and Laidre planned the trip to deploy underwater acoustic instruments at glacier fronts — an important habitat for narwhals. These long-toothed Arctic whales navigate and hunt by making clicking sounds and listening to the echoes bouncing off nearby rocks or prey. The acoustic instruments pick up the narwhals’ sounds, documenting their activity at the glacier fronts. The GINR instruments are attached to moorings—lines more than half a mile long, with a half-ton anchor at one end and the instruments and floats attached at intervals to the other end. 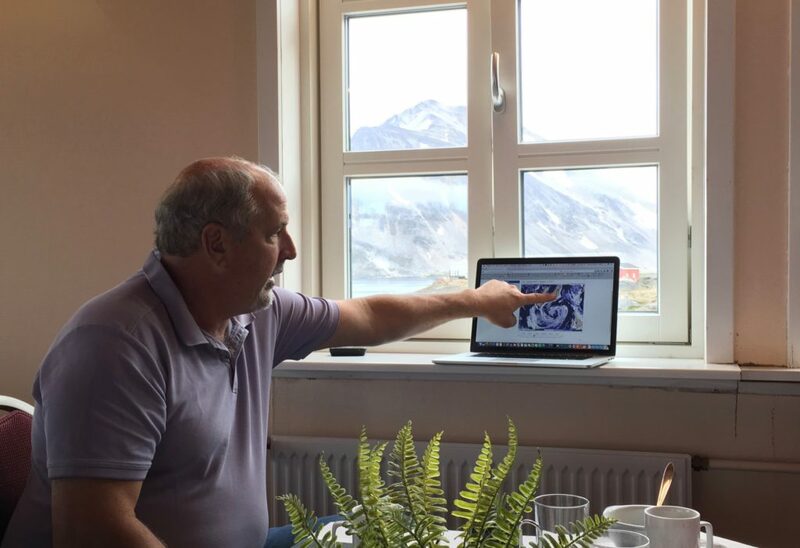 Ian realized that adding OMG sensors of water temperature and salinity to the lines would produce a unique local dataset for OMG and benefit the narwhal research as well. 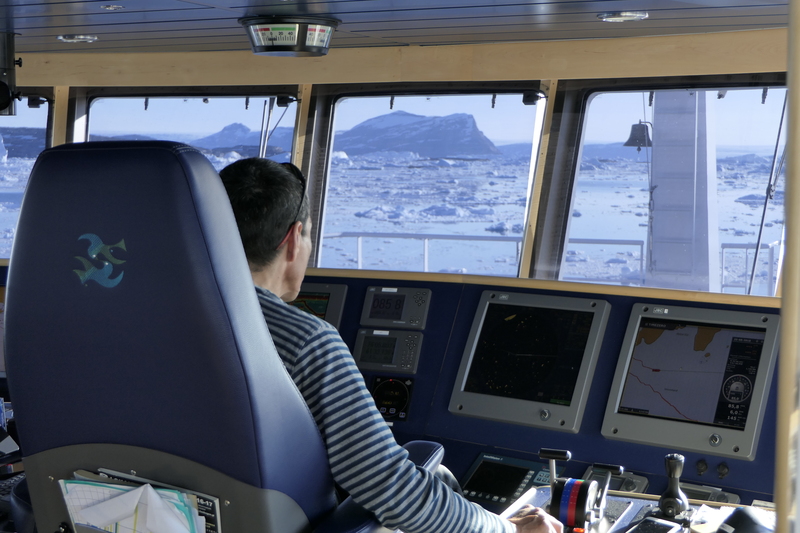 The scientists agreed to collaborate, and Ian joined the team in Upernavik, Greenland, for an eight-day cruise. Getting close to glacier fronts means encountering icebergs. Although Greenland’s bergs don’t match Antarctica’s for sheer size, the island’s fjords and shallow waters are littered with everything from modest lumps to tablelands that dwarf the 106-foot-long (32.3-meter-long) Sanna. “The captain was an expert pilot, with decades of experience in this kind of ship,” Ian said. 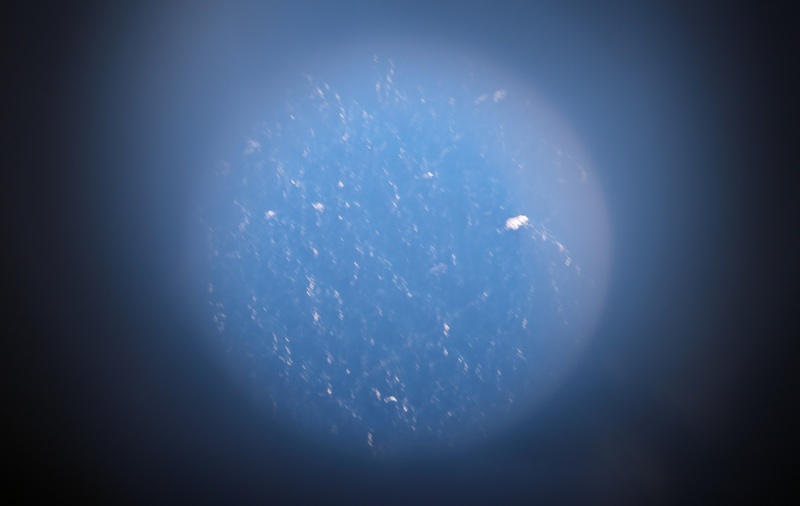 “It was mesmerizing to watch them navigate through a field of icebergs to get to the instrument sites. His concentration was really impressive.” The crew usually work on fishing trawlers that are at sea for weeks, often in much worse weather than the researchers encountered. Once at a proposed site, the researchers had to decide whether a mooring could survive there for two years. 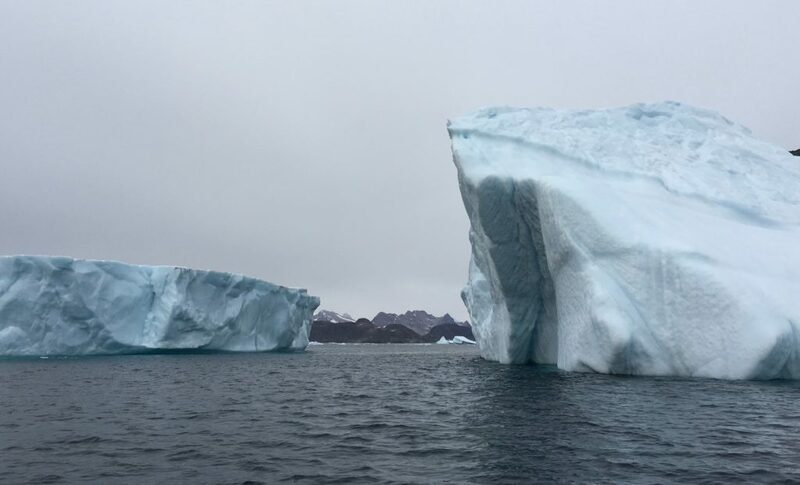 “There were some places that looked good on paper, but when you got there, you could see that they were on the iceberg highway,” Ian said –meaning a current carrying icebergs from a glacier’s calving front. An iceberg can not only rip the line off the anchor, it can drag the entire mooring out to sea, anchor and all. 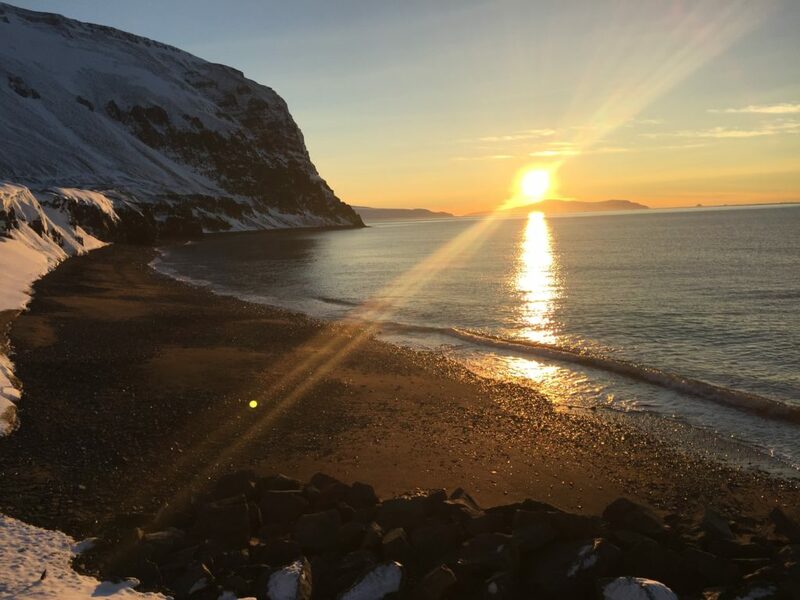 One mooring from Southeast Greenland washed up in Scotland, almost 1,500 miles (2,400 kilometers) away. 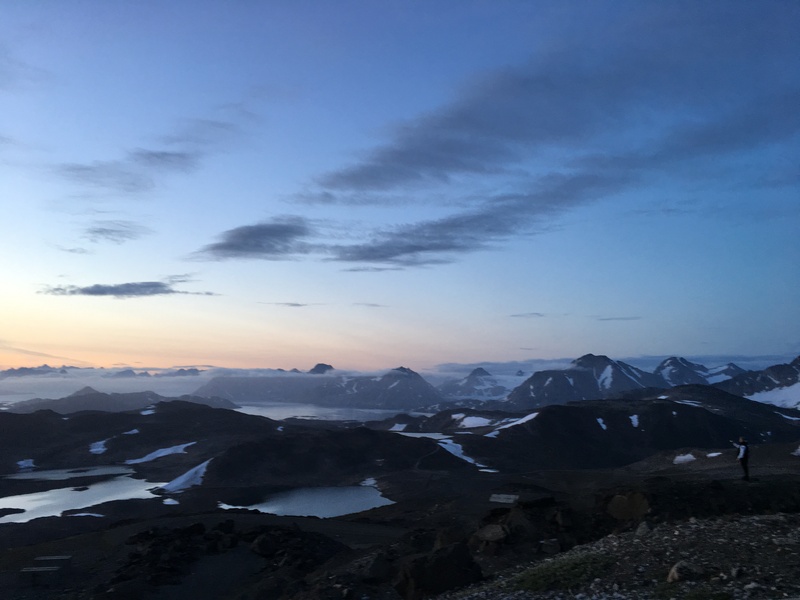 If the planned site looked dicey, the researchers would look for a nearby spot protected by an island or other feature that was still close to the calving front and deep enough to be attractive to narwhals. 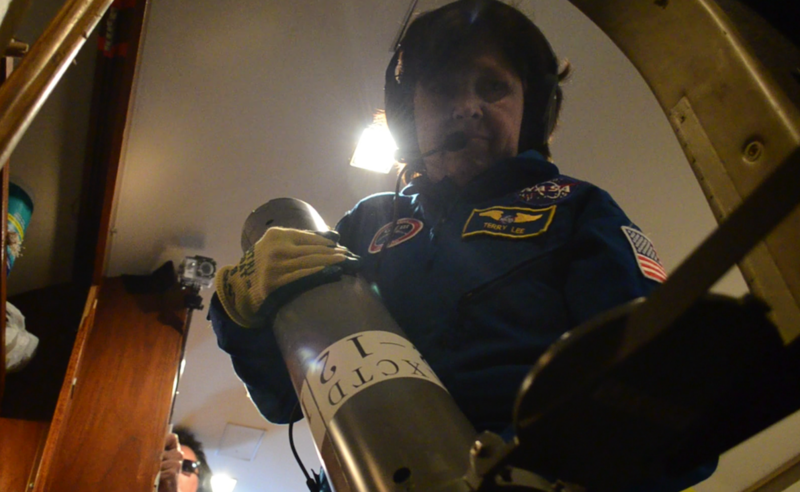 When they had agreed on a new site, the researchers programmed their instruments, and the crew tied them on the line. Then they dropped the whole assembly, surface end first, along a course about a kilometer long. When the anchor dropped, it pulled the line into the proper vertical orientation. The ocean environment may have been wild, but the ship was civilized. 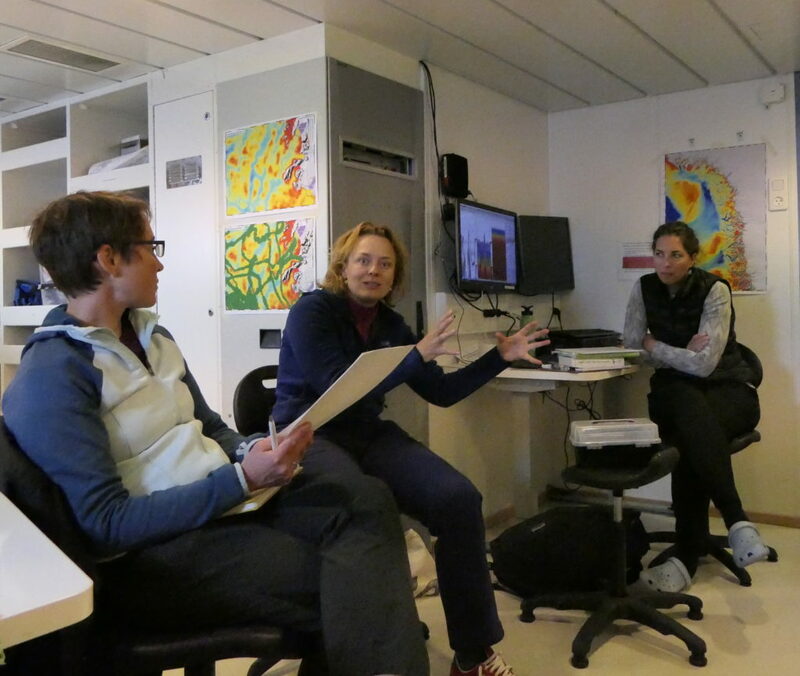 The six researchers and six crew were supplied with wifi, meals to suit both Greenlandic and European tastes, wet and dry labs, and comfortable bunkrooms. Ian will return next summer to change batteries on his instruments. 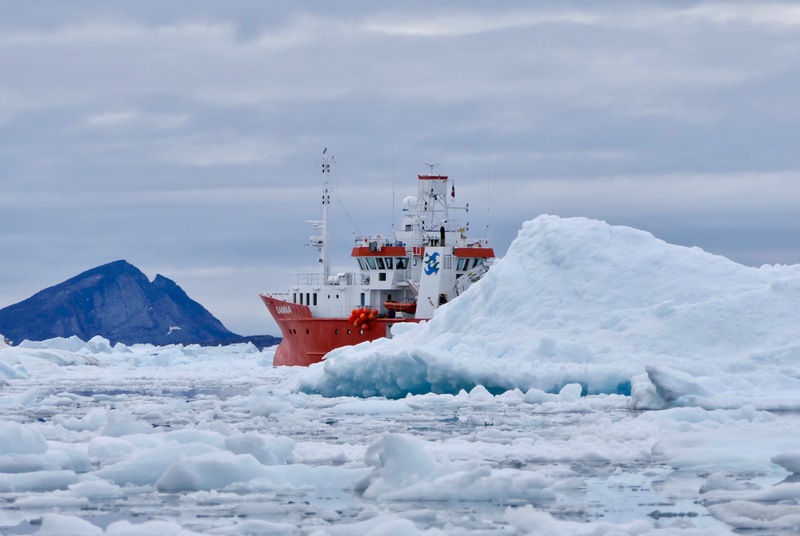 The moorings are equipped to help the researchers find them among next summer’s icebergs. “There’s a simple mechanism that sits just above the anchor and listens for a specific tone sequence,” Ian said. “When we come up in the ship, we play that song and boom! It lets go of the line, and the line comes up to the surface. The mooring has a satellite phone, and it sends its current coordinates to us by email. 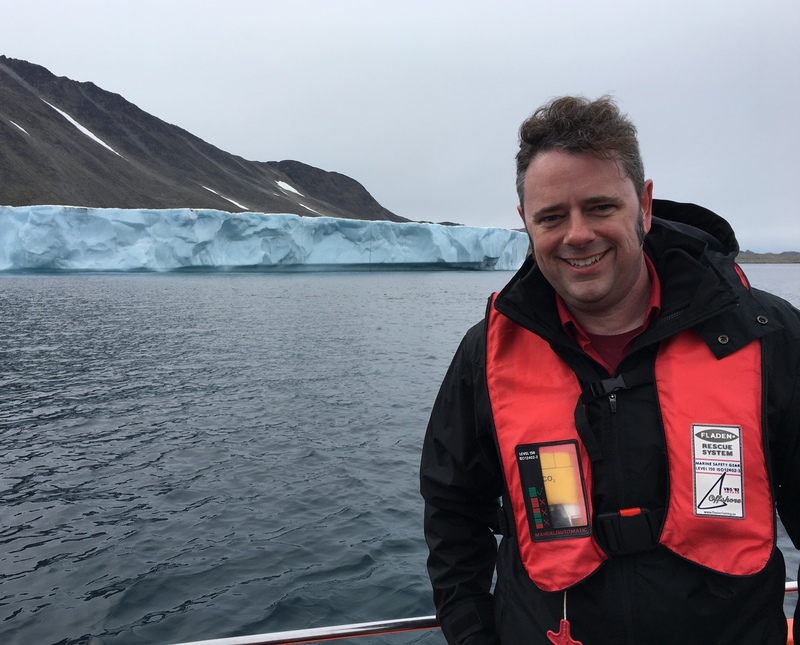 That’s principal investigator Josh Willis’ capsule description of the Oceans Melting Greenland (OMG) campaign so far. 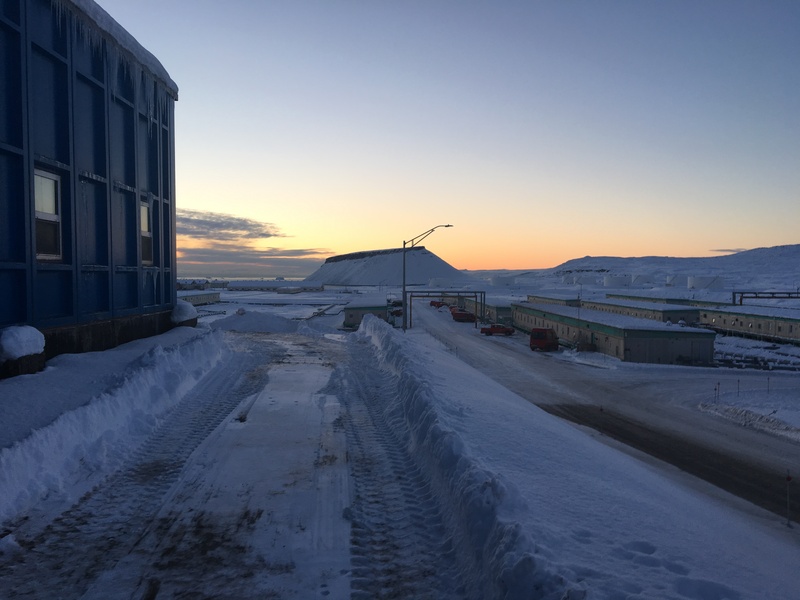 Approaching the end of a month-long deployment in the Arctic, the team members are pacing themselves to finish their mission without running out of energy, patience or clean socks. It’s been a marathon campaign, relocating to a new base every few days, each one in a different time zone. But there are compensations. 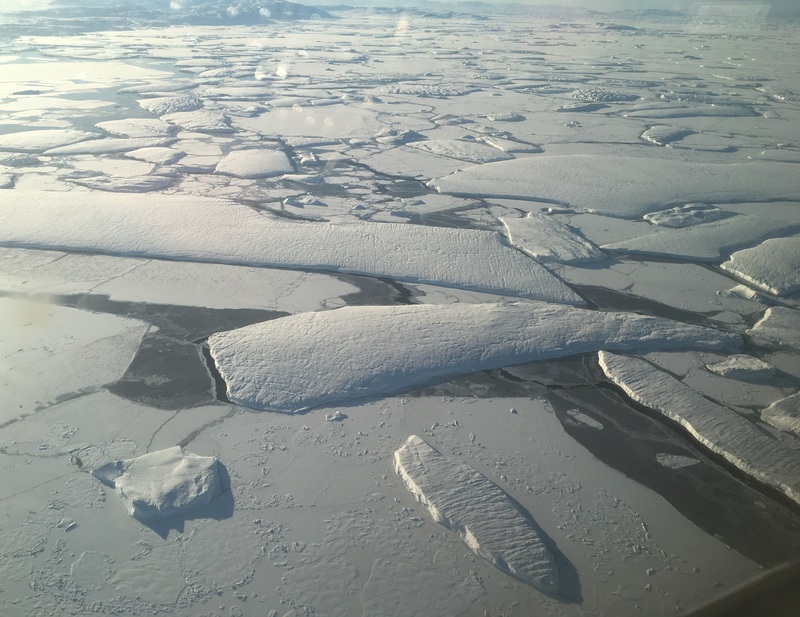 Even the been-everywhere, seen-everything crew of the NASA G-III has been impressed by the spectacular Arctic scenery. Few people on Earth have seen as much of the Greenland coast as this team. It’s a dramatic coastline scored with hundreds of fjords. 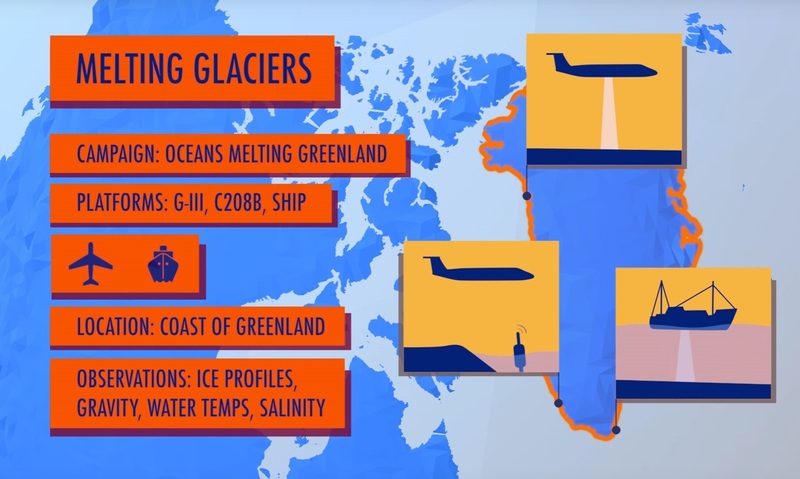 Many contain glaciers—the places where warm subsurface ocean waters may have a chance to melt Greenland’s ice from below. Behind the fjords is a jumble of rock, snow and ice, and in front is ice and water. 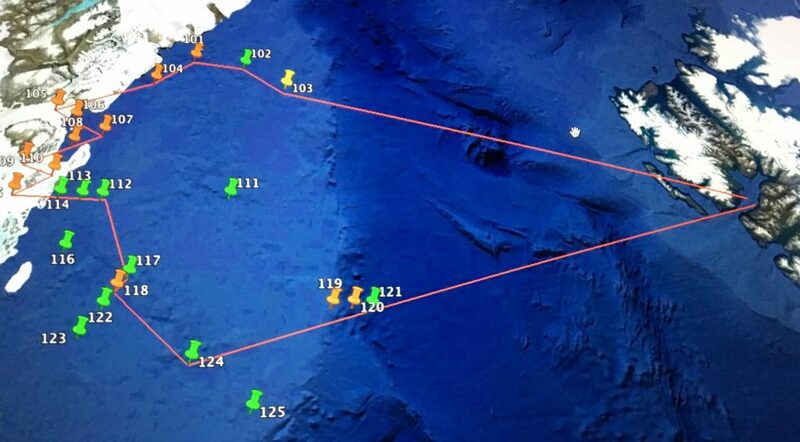 The OMG crew has now dropped about 180 of its planned 250 probes in open water within fjords, along the coastline and out onto the continental shelf. 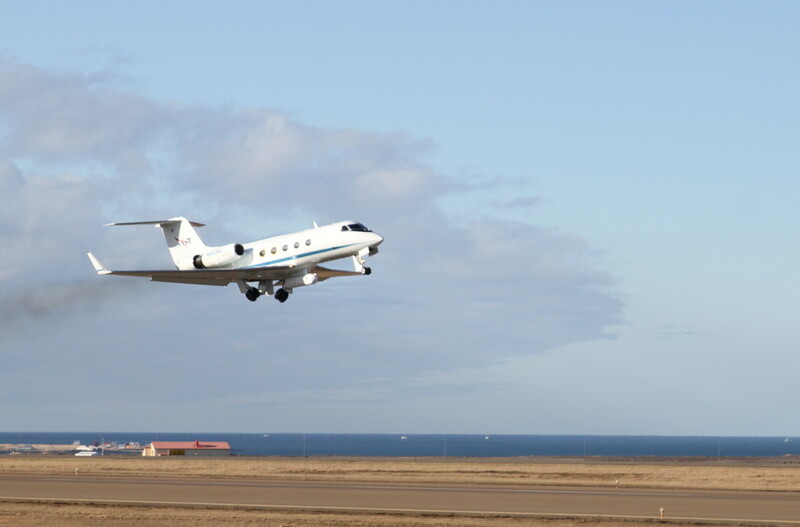 The team has been operating out of four bases: Thule, in northwest Greenland; Kangerlussuaq, in southwest Greenland; the island of Svalbard, Norway; and their current location in Keflavik, Iceland. The bases allow them to stay close to whatever part of the coast they’re measuring rather than wasting fuel flying for hours across the huge island from a single base. Each base is in a different time zone, and the farthest jump is five hours’ difference. Blizzard season starts in mid-September in cold Thule. 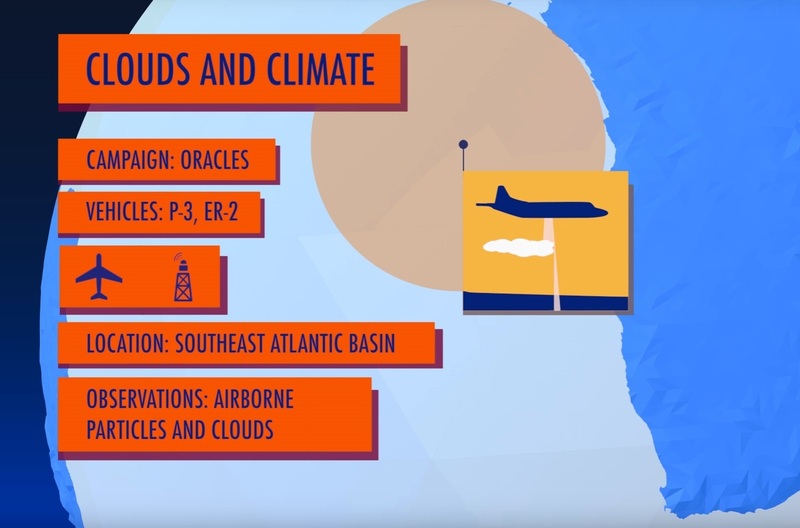 This being an air base, storms are ranked using the air controller’s alphabet: Alpha, Bravo, Charlie or Delta. One night, the OMG crew watched conditions deteriorate to Charlie—complete lockdown. “The winds blow snow from the local icecaps so thick that it decreases visibility and it’s dangerous to be outside,” Willis said. “You don’t go outside at all. We used the time to get a little bit of outside work done and answer emails.” The storm lasted about 20 hours. Having that much time for anything but work was something of a luxury on a field campaign. 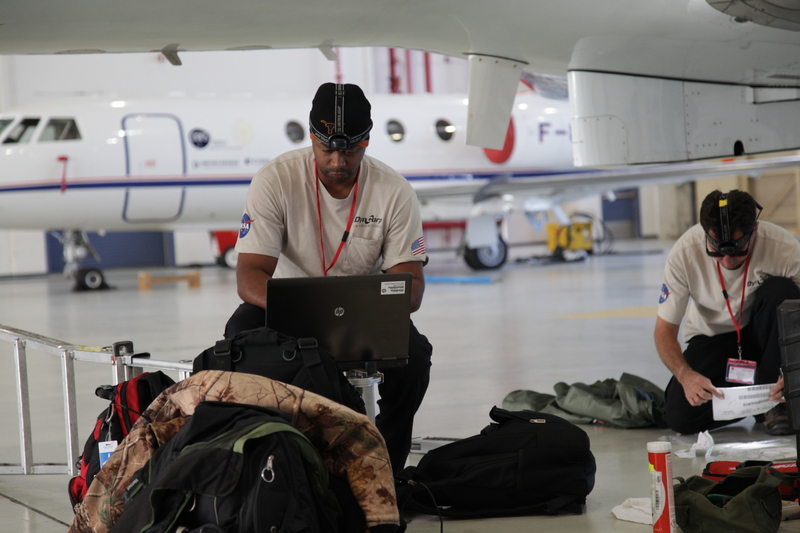 The crew is required to take a “hard down” day after every six flight days, giving them a chance to catch up on sleep or chores. But in a new location, one day may not be enough to find fresh produce, do laundry or pick up supplies that have run out. Hotels offer most of these services, but the fee can be hefty. One crew member grumbled that he was charged $90 for a small load of laundry at an earlier stop. When I asked what happens if someone gets sick, the crew just looked at me. Finally, flight engineer Terry Lee said, “You try to stay away from the other people.” That’s not physically possible in a small plane. But staying home isn’t an option either. The next is a story that begins “When we were in . . . ” could continue anywhere: Kazakhstan, Alaska or the Middle East. This is a team that has been working together well for a long time, in more far-flung locations than most world travelers even dream of. Arctic cold hasn’t added a lot of additional maintenance chores, Fuller said, because the planes are in heated hangars at their bases. The main difference Is air pressure. Just as you change your car’s tire pressure in winter in a cold climate, the plane systems also need to change. It’s not just tires: it’s things like the brake accumulator pressure—the reserve air needed for emergency brakes. “If the conditions are set correctly on the ground, then the plane will be fine while flying,” he explained. All three pilots had former careers in the military, and Reagan is planning to undertake a third career soon that some people would find even more intimidating than his first two: teaching high school history or physics. 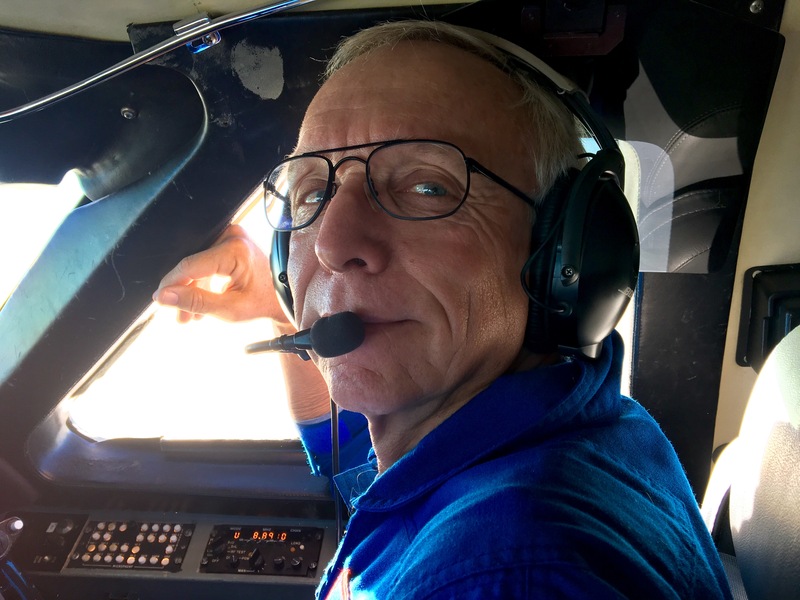 “Never in my life did I think I’d get to drop things out of the airplane when we were out flying,” said flight engineer Vaughn. A flight engineer is responsible knowing all the plane’s electrical and computer systems and monitoring them during the flights, as well as supporting the pilots. On top of that, it’s safe to say that Vaughn and Terry Lee are the world’s experts on dropping probes out of a G-III—this is the first experiment ever to do such a thing, and the aircraft had to be specifically modified to allow it. “It’s kind of a rush,” Lee said. 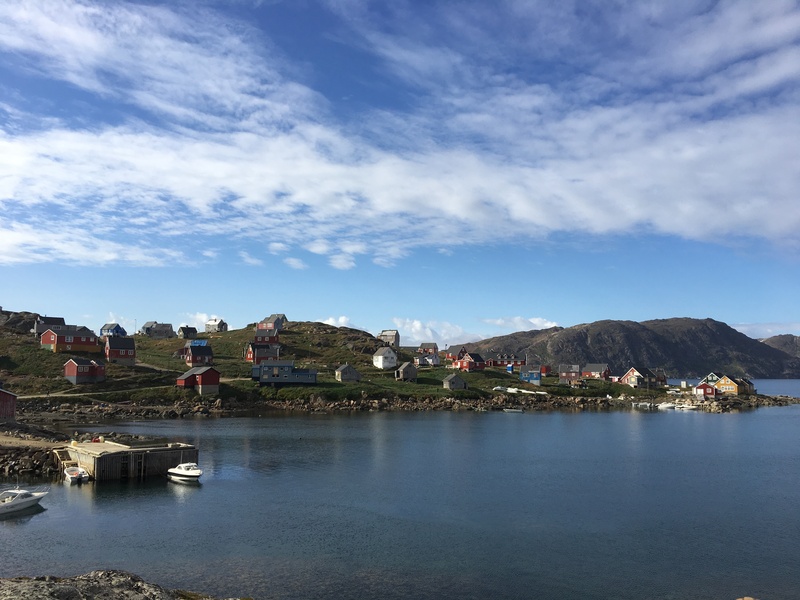 The Oceans Melting Greenland science team carefully planned each location for the team to drop its ocean probes. Some sites are in narrow fjords; others are hundreds of miles out on the continental shelf. Each site was chosen to add value to the data the team is collecting. The two biggest enemies of this planning are ice and weather. Sea ice is at its lowest at this time of year, but there’s plenty of it around Greenland, especially in the north. The probes can’t punch through it to reach the water below. 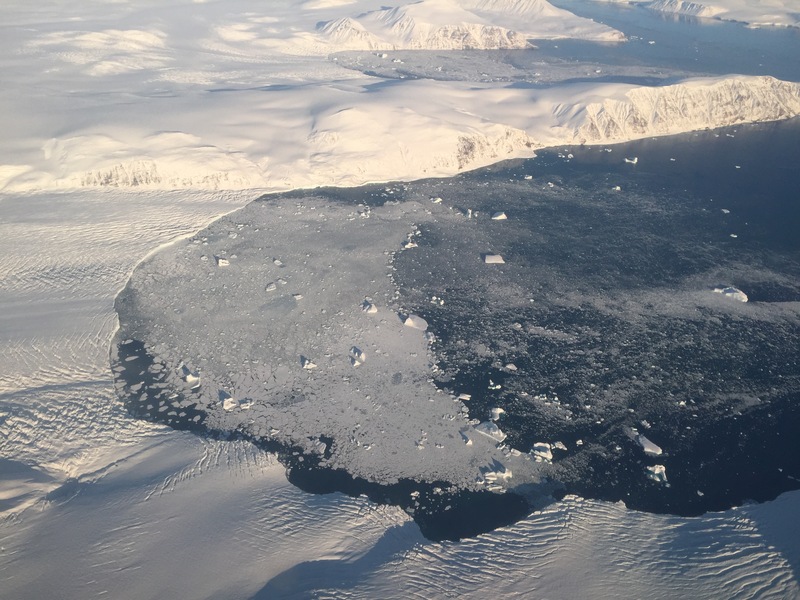 If a drop site is ice covered, the team looks for a location that is “close by and second best,” said principal investigator Josh Willis. They might need to go to the next fjord over or a bit farther out on the shelf. Since no data whatsoever have been collected from much of the northern coastline, these alternatives have value too. Project manager Steve Dinardo has been working on airborne projects for 38 years. “Weather is always the problem. When you don’t want clouds, you get clouds. When you want clouds, you don’t get them,” he said. 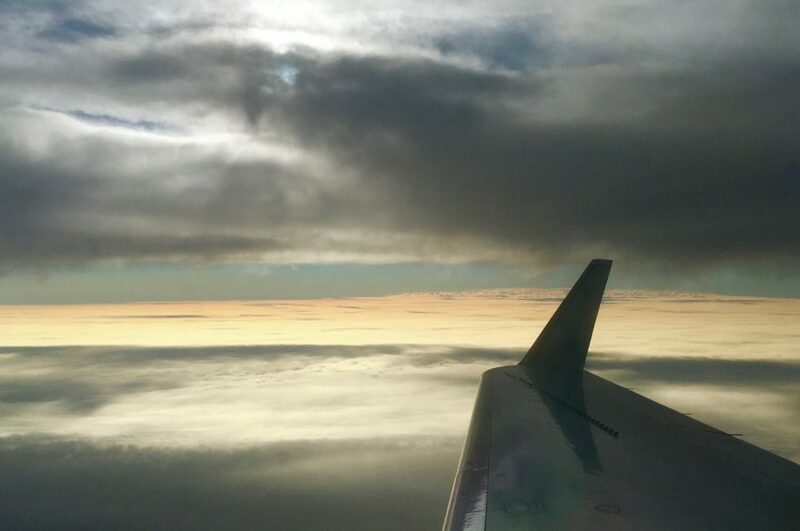 Turbulence can be a problem as well. To prepare and drop the probes, team members have to move around the cabin, not sit with the seatbelts securely fastened like commercial airline passengers. 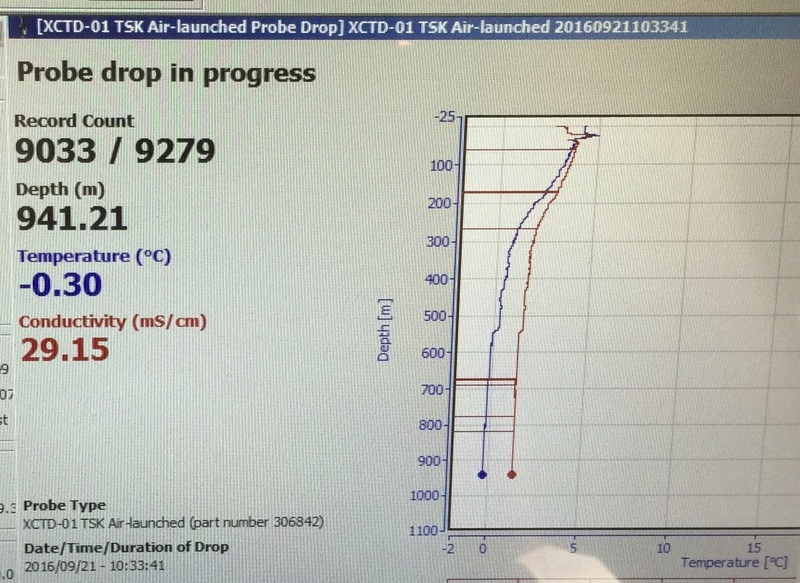 On the windy flight of Oct. 1, Dinardo was sitting at the computer to read the probe data. “We were getting pretty hammered in the back,” he said. “Between me vibrating up and down and the keyboard vibrating up and down, I hit a number-lock key on the keyboard. The computer froze and I had to reboot it.” Despite that mishap, it was a successful day, with 14 probes dropped and returning signals. Today, however, weather is keeping the team on the ground. 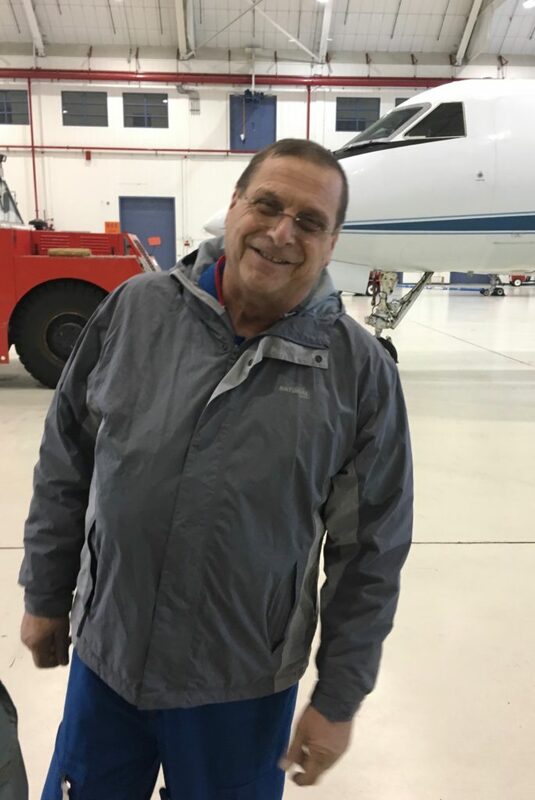 For several days, Dinardo and senior pilot Bill Ehrenstrom have been watching a forecast storm approach from the south. Today, it finally arrived. 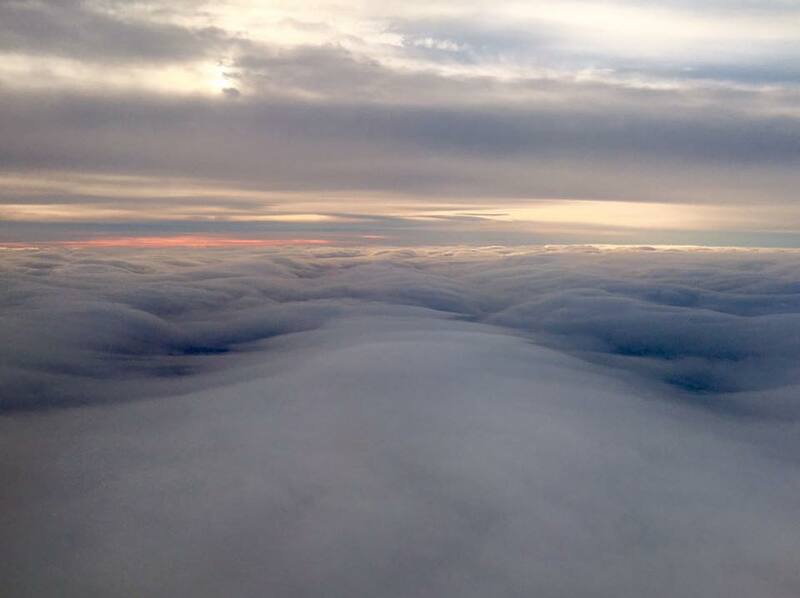 The crew was grounded by clouds and gusty winds over Greenland. Tomorrow doesn’t look any better, with the forecast calling for gusts up to 55 miles per hour. 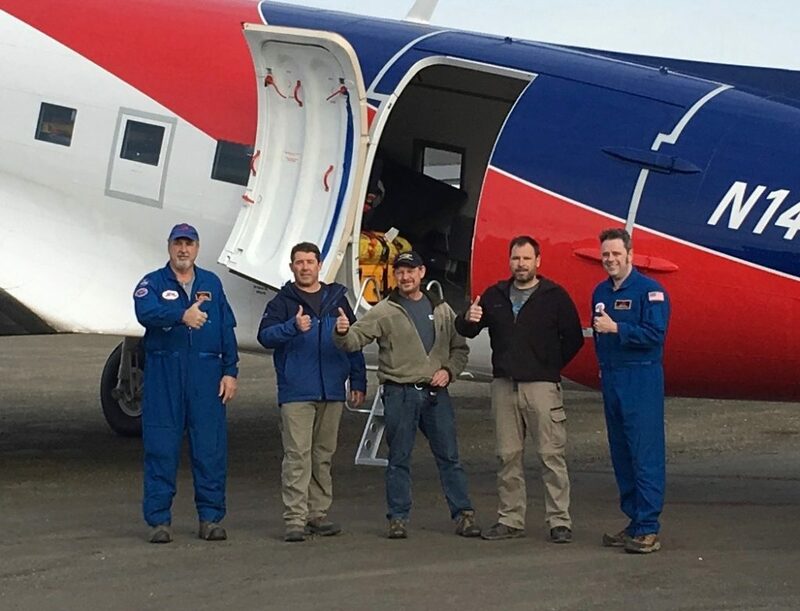 “I think we have at least one more day before we have any chance of flying,” Ehrenstrom said, though he won’t make the final call till tomorrow morning. 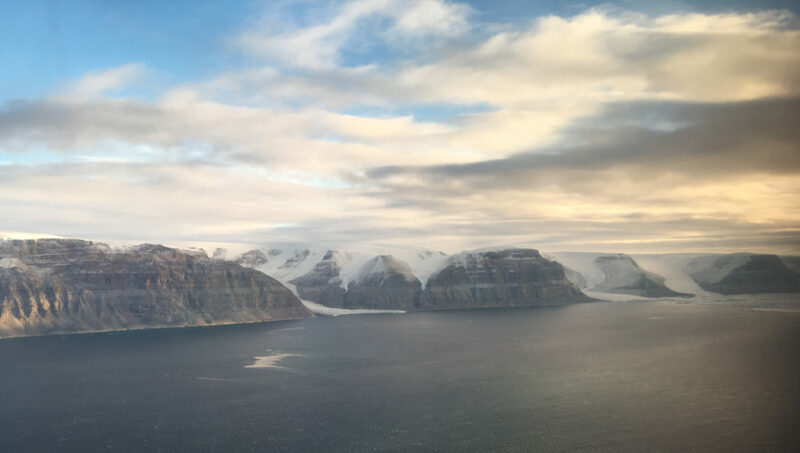 Over the last three weeks, the Oceans Melting Greenland team has spent many hours flying over spectacular Arctic scenery. 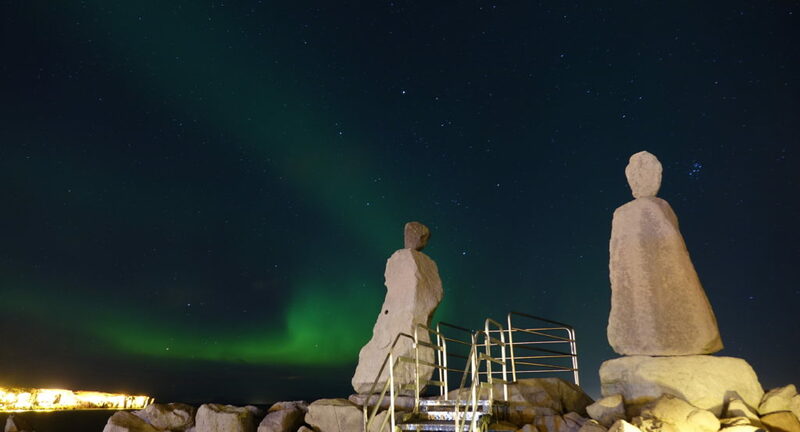 Fjords, glaciers, icebergs, the northern lights — they’ve seen enough sights to fill a guidebook. But the most compelling view, the view they came all the way north to see, is on a computer screen inside the plane. 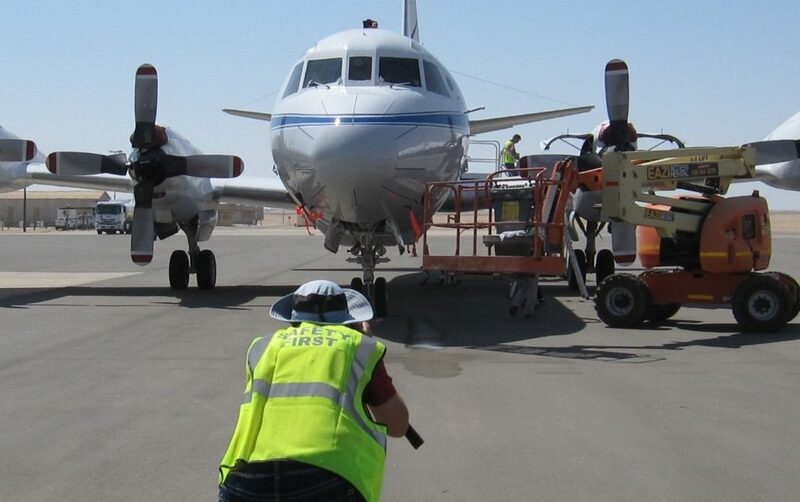 OMG is in the field this fall to do one thing 250 times: drop ocean probes from an airplane around the entire coast of Greenland and read its measurements of ocean temperature and salinity. 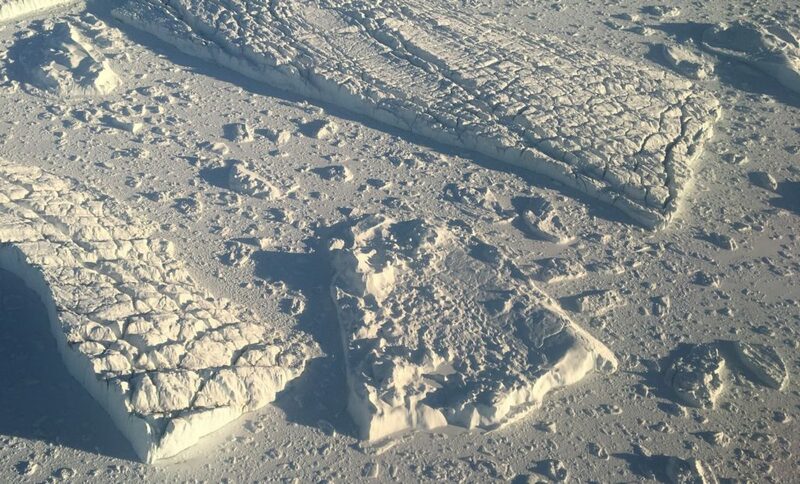 Relayed to the airborne computer, the data from the probes shows where warm, highly salty, subsurface Atlantic water is able to reach the bottoms of glaciers along the coast. The computer on NASA’s G-III aircraft shows an ocean probe’s measurements as it sinks through the water near the Greenland coast. The water is warmest and saltiest near the surface. This water is warm only in comparison with the polar runoff that forms the surface layer, but its extra 6-8 degrees Fahrenheit (3-4 degrees C) makes it plenty warm enough to melt glacial ice. The polar water can be as cold as 4 degrees below freezing Fahrenheit (-2 degrees C). At those temperatures it doesn’t melt ice at all. 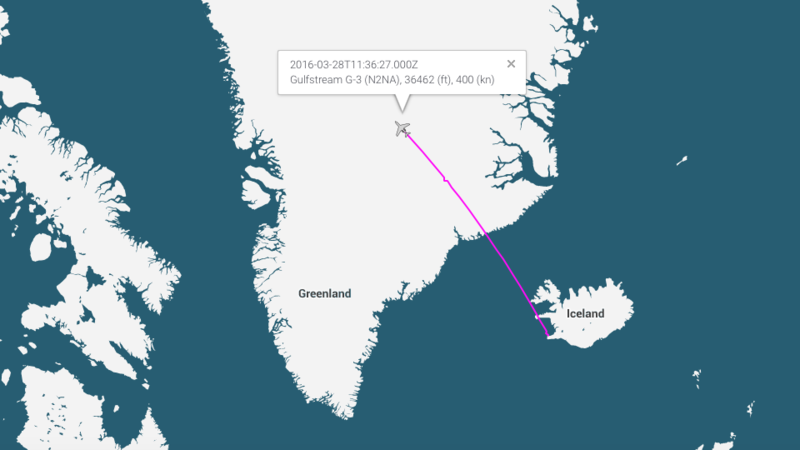 On 13 research flights since Sept. 13, the team has dropped 163 of the probes around all of Greenland except the southeast coast. 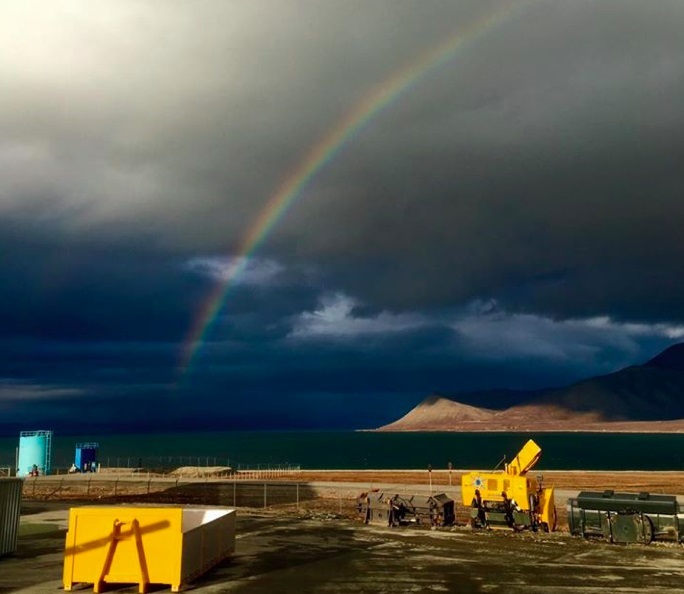 They’ll pepper that coastline with the remaining probes from their new location in Keflavik, Iceland. The probes relay their measurements in real time to the airborne computer, so the OMG team got views of subsurface conditions starting with the very first drop. As the measurements kept rolling in, the view from the computer screen became more and more disturbing. “Very soon, it became clear that there was a good deal of warm water on the shelf — not just in the fjords but spread out. As we mapped farther and farther north, we could see more warm water on the shelf. 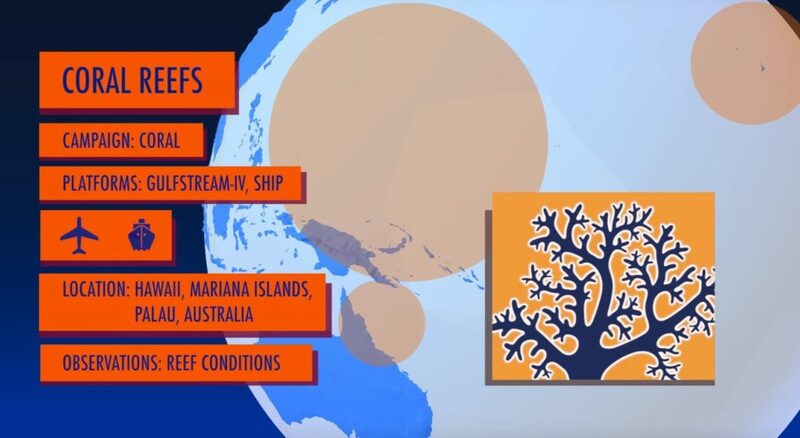 Now we’ve sampled [most of] the continental shelf, and everywhere that it’s deep enough, there seems to be Atlantic water present,” Willis said. 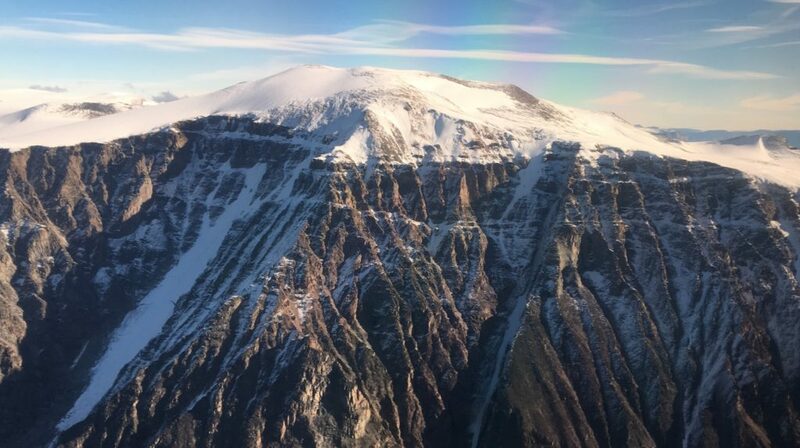 It’s unlikely that the southeast section will contain surprises, he added, because scientists already know that glaciers in this sector are melting very quickly and ocean warming is evident on the surface. 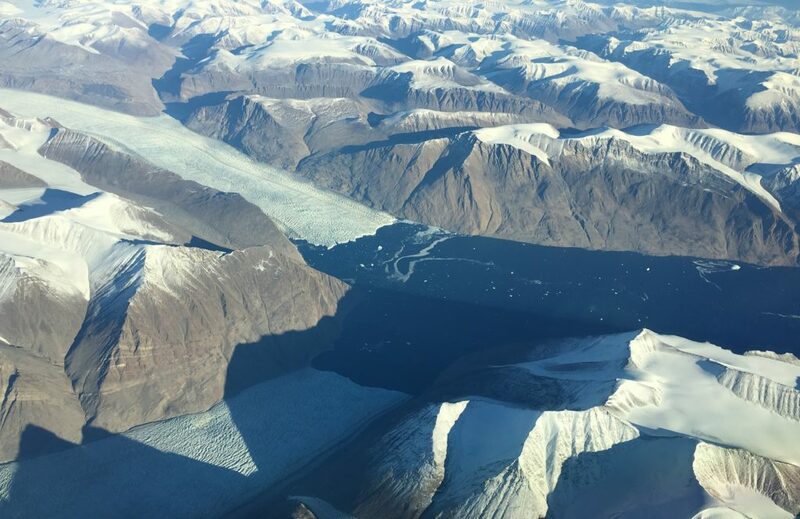 Crew members of NASA’s Oceans Melting Greenland mission have seen extraordinary sights during their latest deployment, both from the plane and at their four bases. Here are a few highlights. OMG: We’ve Returned to Greenland! 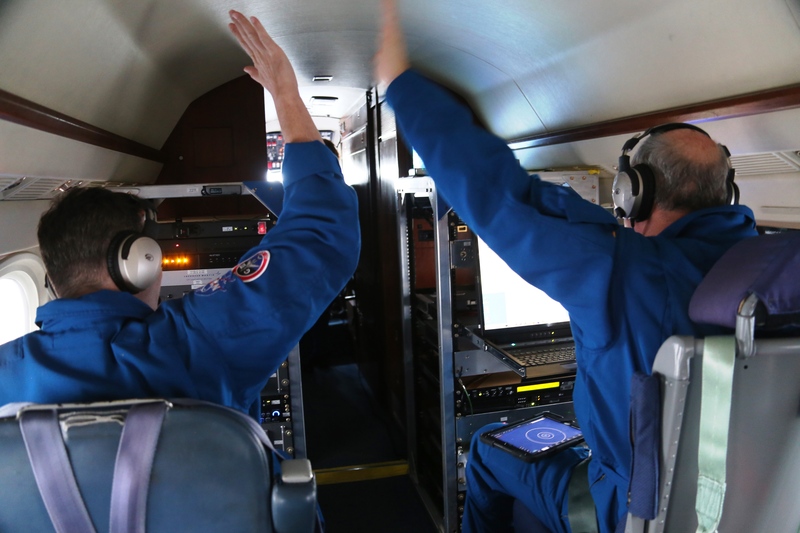 NASA’s Ocean Melting Greenland, or OMG, campaign is back in the Arctic, and this month it’s dropping scientific probes out of a NASA aircraft into the water just off Greenland’s coastline. 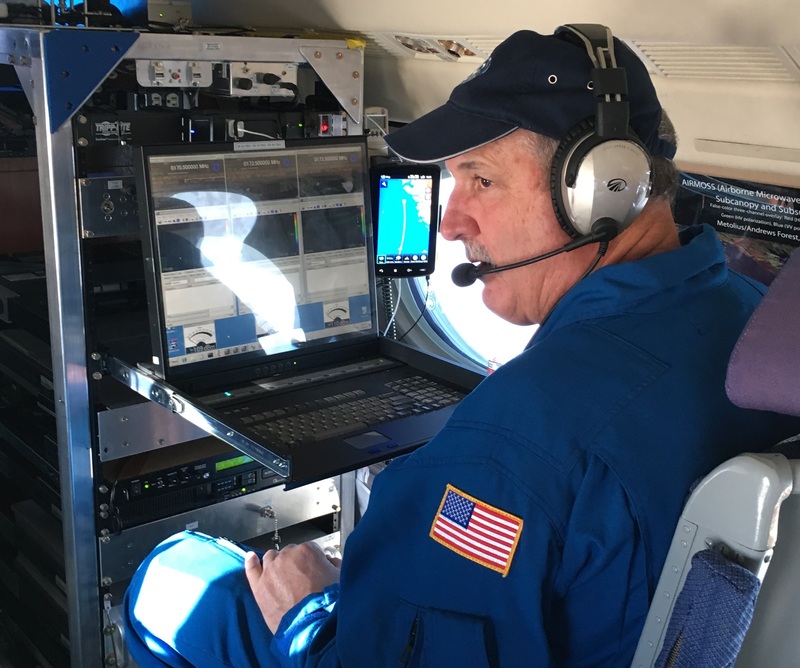 The probes are the fourth and final part of OMG’s observations this year documenting how seawater is melting the underside of the world’s second largest ice sheet. Three things about Greenland: it’s huge, it’s remote, and it’s melting so fast that scientists use words like “falling apart” and “vanishing” to describe what they’re seeing. But the hugeness and remoteness mean that many parts of the island have gone completely unmeasured. There aren’t enough data for scientists to be confident that they understand how processes are interacting now, much less how the melting will progress in coming years. 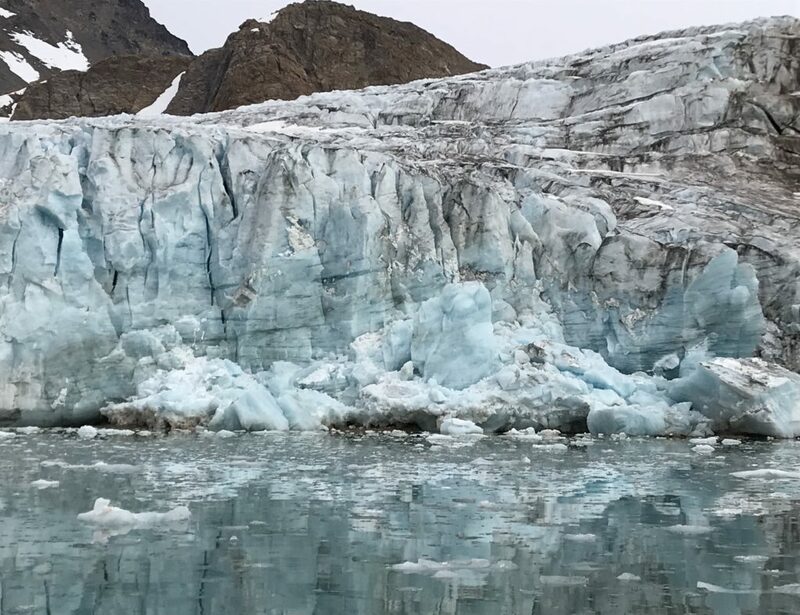 “It’s hard to predict what’s going to happen to Greenland because we’ve never watched it melt before,” said Josh Willis, OMG’s principal investigator with NASA’s Jet Propulsion Laboratory, Pasadena, California. The measurements OMG is making this month, and over the next four Septembers, should reduce some of the uncertainty. 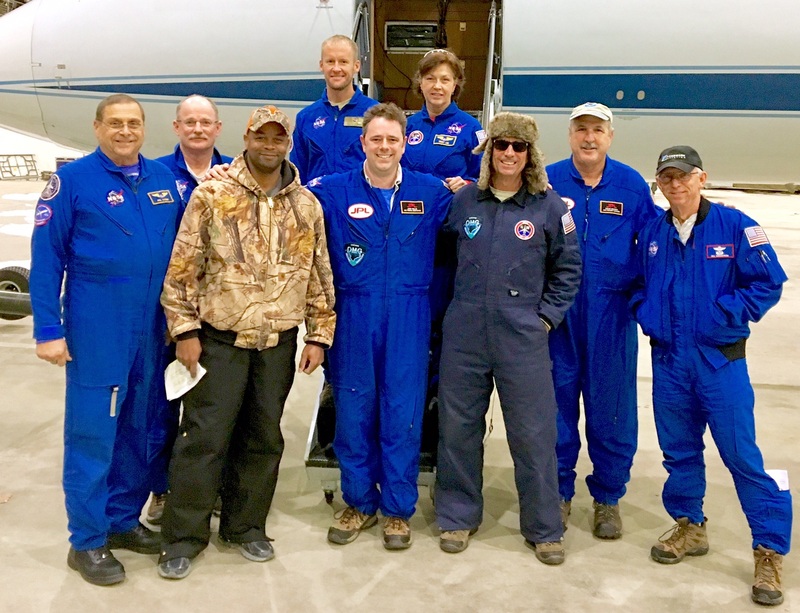 The OMG team, left to right: Flight engineer Phil Vaughn, pilot Scott Reagan, engineer Johnny Scott, engineer Charlie Marshik, principal investigator Josh Willis, flight engineer Terry Lee, engineer Dave Fuller, project manager Steve Dinardo and pilot Bill Ehrenstrom. 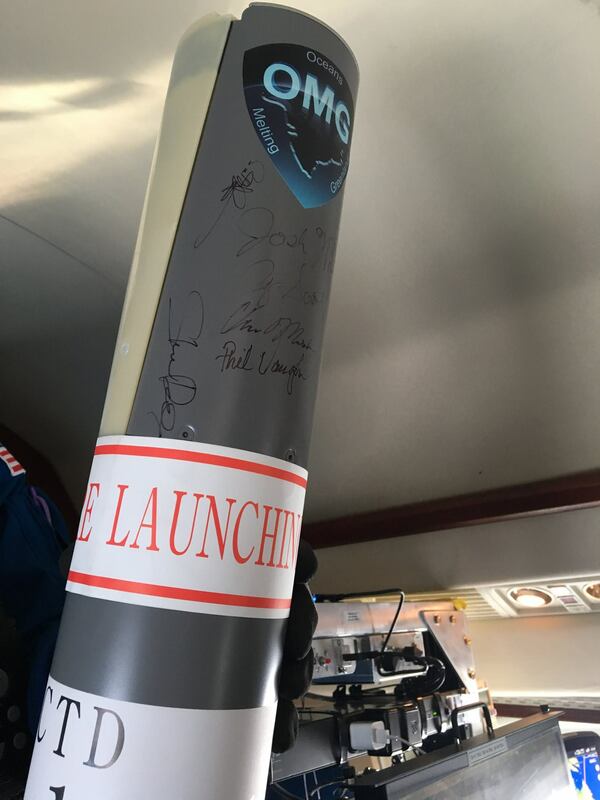 Willis and Dinardo are from JPL, the rest of the team from NASA’s Johnson Spaceflight Center. To collect data around Greenland’s entire coastline, the OMG team is using four bases. Slice two imaginary lines across the island, one north-south and the other east-west, and there’s a different OMG base for each quarter, more or less. The bases for measuring the west side of the island are on Greenland itself; for the east side, the bases are in Iceland and on the Norwegian island of Svalbard. OMG isn’t moving methodically around the island. It’s spending a few days in one location and then another, sometimes doubling back to the first location, as logistics and weather dictate. 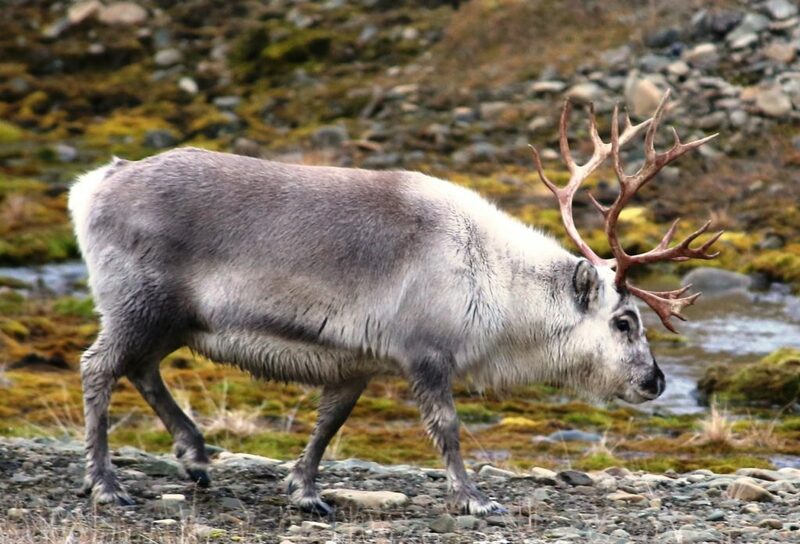 An Earth Expeditions reporting team will catch up with the team in a few days from Iceland. 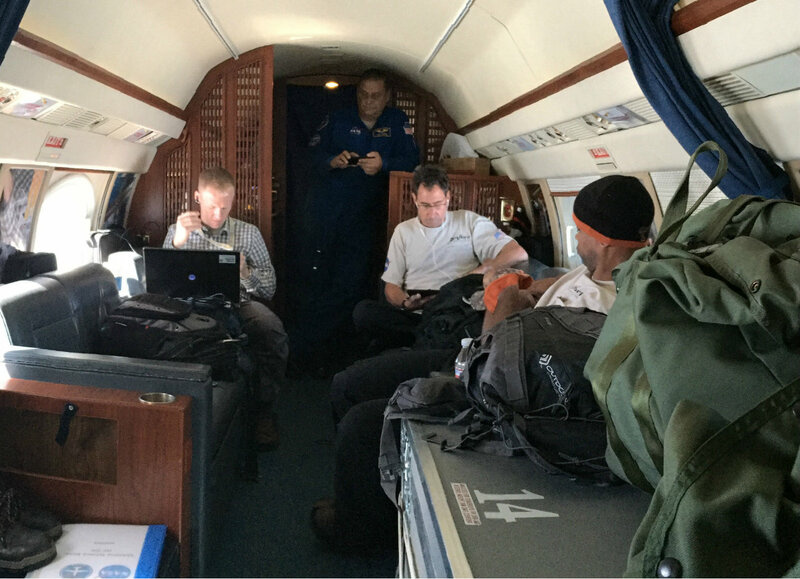 For now, here are some images from the field, captured by the team members themselves. 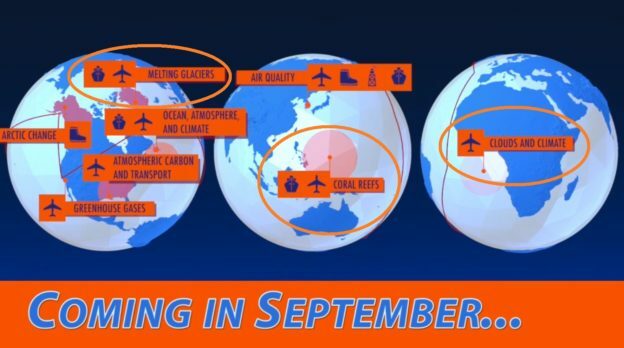 Willis and the other OMG scientists timed this campaign to coincide with the Arctic sea ice minimum (conditionally announced on Sept. 10) so they would have the best chance of finding open water to drop probes into. But even at minimum, there’s still plenty of ice around Greenland. In loosely packed ice like this, dropping probes has been no problem. But in other locations, the water is almost completely covered with big plates of ice separated by narrow cracks, testing the team’s ability to hit their open-water targets. 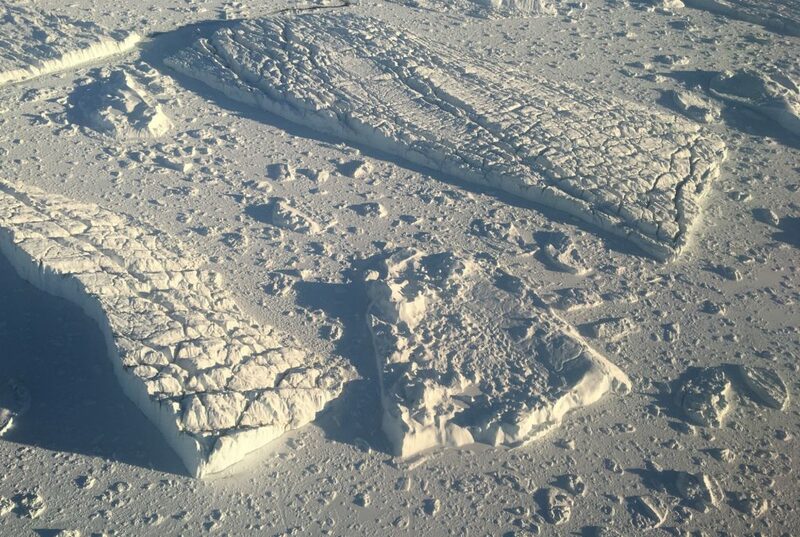 Some areas are completely ice-covered, with no possibility for dropping probes. If you want to drop probes along the coast, you need to be able to see the coast. The weather doesn’t always cooperate. On this day, no data were successfully collected. The probes are similar to those dropped by hurricane hunters to monitor the ocean during storms. There’s a parachute to waft the package safely to the ocean surface. When it hits the water, a float inflates to hold up a radio transmitter. A sensor, tethered to the transmitter by wire, sinks some 3,000 feet (if the water is that deep), measuring water temperature and salinity on the way down. The transmitter relays these data back to the aircraft. 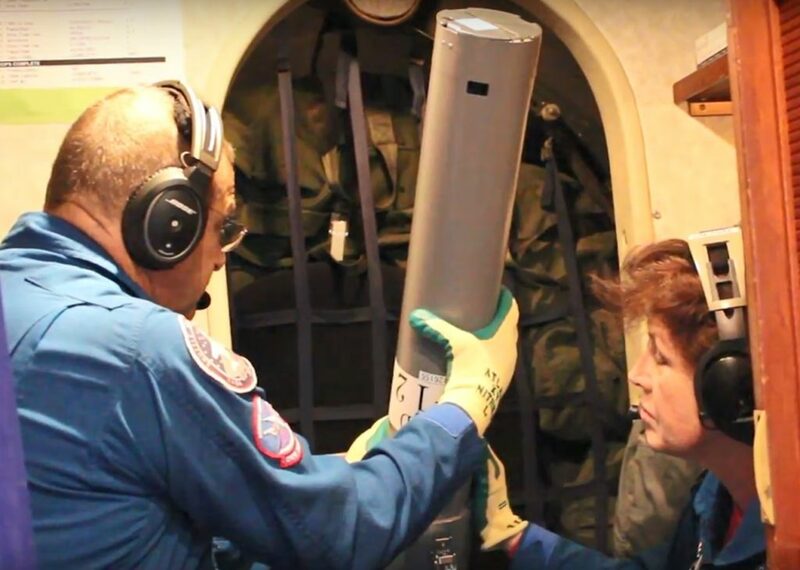 OMG will drop about 250 of these probes by the end of its deployment in early October. Combined with maps of the seafloor shape around the coast that OMG is also producing, the probe measurements will give a picture of where warm, deeper water can creep onto the continental shelf and eat away at the glaciers fringing the ice sheet.